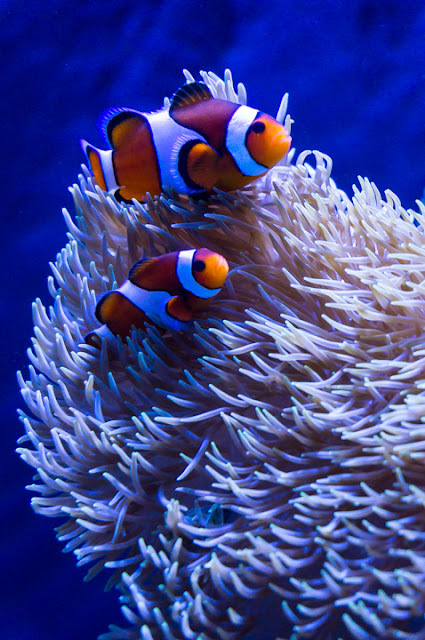 Clownfish have what's called a symbiotic relationship with their host creature, the sea anemone. The sea anemone provides the clownfish with protection from predators as the anemone has stinging nematocysts in their tentacles. There is some debate as to how exactly the clownfish is not stung by the anemone. Regardless, in return for the protection the sea anemone gets nutrients from clown fish excrement. It sounds like a bit of a raw deal for the anemone but in the battle for existence you can't complain about extra nutrition. Beyond the free excrement it has been hypothesized that the colorful clownfish actually lure in small fish for the anemone to eat (a tough way to leave the world, tricked by a clown). In addition the clownfish help scare away sea turtles which eat the sea anemones. While no one expected Pixar's Finding Nemo to be a bastion of biological accuracy I would have liked to see Marlin (Nemo's dad) get really territorial and instinctively pick a fight when he meets the sea turtles.